Update: Part 2 of this series is now online. 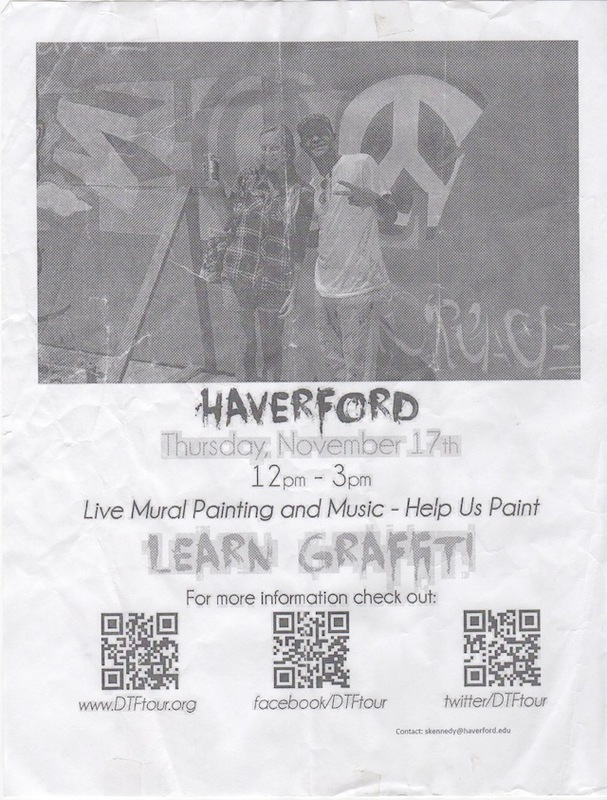 On November 17th, the Defend The Future Tour came to Haverford College, spray cans in hand, in what now seems to me to have been an attempt to manipulate students into having a greater hate and fear of the Arab world and a greater love for Israel. This would have been fine, except for the manipulation. I go to Haverford College, so I experienced the DTF Tour myself. “Sounds good to me,” I thought. Those seem like sentiments that most college-aged people would agree with. The website also cleared up a bit more about the tour. Basically, a group of artists were going around and visiting colleges in the Philadelphia area to paint murals and interact with students. Again, sounds pretty good. What you’ll also find on DTF’s website is their “Demand The Facts” page. This is where my concerns began. On that page, it finally occurred to me that the DTF Tour might really be an effort in pro-Israel propaganda. And yet, that single page is the only place on the DTF Tour website where I found any mention at all of Israel or evidence of the DTF Tour’s partisan political aims. By looking on their facebook fan page, I discovered that the DTF Tour might be linked with Artists 4 Israel, a group of pro-Israel street artists and graffiti writers, and the connection was finally confirmed by posts on Artists 4 Israel’s blog that the DTF Tour was an Artists 4 Israel initiative (later, I found a single reference on Haverford’s website that the event was led by Artists 4 Israel). Again, this seemed strange. Why didn’t Artists 4 Israel just come out and talk about their involvement on the DTF website? After all, Artists 4 Israel certainly seems proud of the tour’s stop at Temple University. Through this article about the DTF Tour’s stop at Temple, their message became a bit more clear: They were trying to spread a message that is “pro-Israel, pro-peace.” Like the DTF Tour’s mission, if that’s what they were really about, I think it’s certainly a message that many people who are middle of the road or even pro-Palestine would agree with. Of course, it’s one of JStreet’s slogans. But after seeing the DTF website, was hard to believe that they were really pro-Israel and pro-peace except perhaps at great expense to the people of Palestine and others in the Middle East. In case it is not already evident, I have to acknowledge that my own views are largely sympathetic to the Palestinian people and in favor of a two-state solution. With only a few days before the DTF Tour was due to arrive at Haverford, a Palestinian friend of mine and I decided that the thing to do might be to hold a similar art-making event right next to the DTF Tour simultaneously, so Besan Radwan and I got planning. Our event would be pro-people, pro-peace. Rather than being divisive and partisan, we thought we would try to bring people together through art. Of course, if we were wrong about the DTF Tour, we did not want to potentially take away from a valuable event. So I met with Seth Kennedy. Kennedy is a classmate of mine, the president of the Haverford Israel Coalition and the man who arranged for the DTF Tour to come to campus after he heard that they were looking to visit Haverford. Kennedy did not believe that the event would be particularly partisan or political. I had my doubts, so Radwan and I decided that we would speak with the organizer of the DTF Tour while they were setting up and decide then how to proceed. Essentially, it came down to asking the group to include the phrase “pro-Palestine” or “pro-people” on their mural if it was going to say “pro-Israel, pro-peace” like the mural at Temple. We felt that, if the event were truly an effort at ending partisan politics, it should address more than one group of people involved in the conflict that the tour appeared to be at least partially about. Around 11:30am on the 17th, I saw the DTF Tour setting up. They had erected a temporary wooden wall to paint on. I spoke with Seth Wolfson, the Chief Visionary Officer Vice President of Artists 4 Israel. He expertly calmed my fears about the event and convinced me that the event and the mural would be multi-cultural. Additionally, he agreed not to put the phrase “Pro-Israel, pro-peace” on the mural. 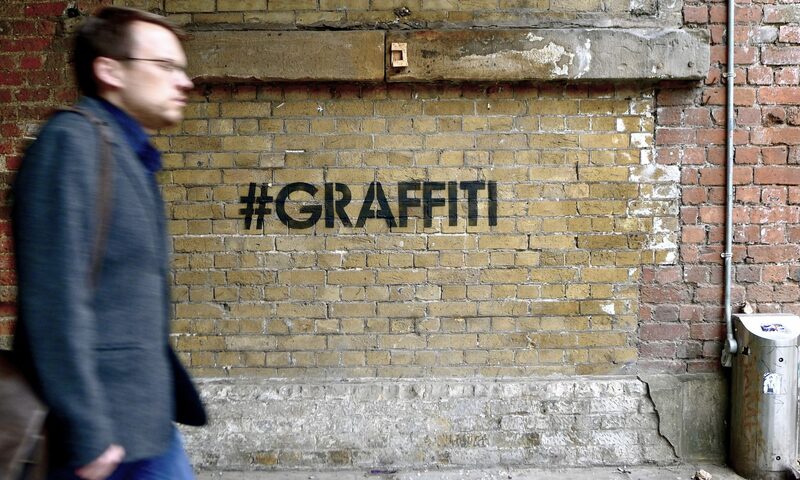 In fact, the idea for the mural was to show a Hasidic Jewish man and an Arab man smoking a hookah together. Frankly, I was blown away. I was not expecting that, but it was certainly a pleasant surprise. Radwan and I both decided that our event was not a necessary addition to the day, so we left and went to class with the expectation of returning later to see how things were progressing. So much for being an all-inclusive event. My reaction to this flyer was one of disgust and disappointment, as well as fear that Haverford students had been receiving these flyers throughout the day. Immediately, I could tell that even some of my friends who are, for lack of a more nuanced label, pro-Israel would take issue with at least the rhetoric of the flyers for being counterproductive to dialog and reasoned debate. 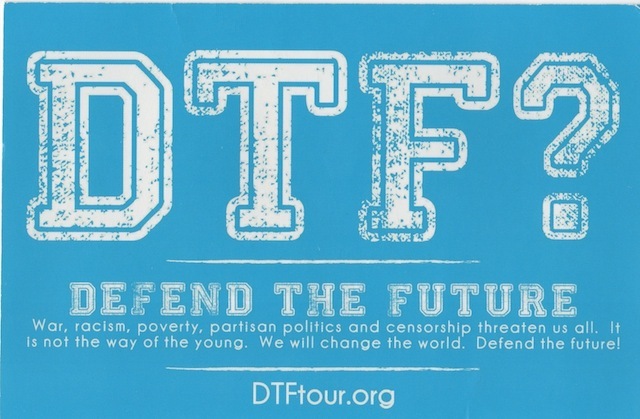 In tomorrow’s post, I’ll go into more detail about each section on the back side of the flyer, but even if the flyer is 100% accurate, it shows clearly that the DTF Tour’s propaganda strategy is not one of working towards diversity and a peaceful coexistence or against fanaticism and partisan politics. As soon as I brought the content of the flyers to the attention of Kennedy, who was in charge of restocking the table with flyers and other DTF Tour materials, he also grew concerned and decided to not put out any more of the flyers. By that evening, news of the DTF Tour’s event had spread throughout campus. After a half dozen students, plus myself and Kennedy, had posted comments about the event on an online forum for Haverford students, another student and a co-head of End of the Land: An Israel-Palestine Discussion Group arranged for people to meet up the next day to discuss their concerns about the DTF Tour in the flesh. That student, Aaron Madow, leads End of the Land with Radwan. They formed the group in an effort to find common ground between students on different sides of Israeli-Palestinian conflict. Frankly, I feel that the DTF Tour’s visit to Haverford damaged the community. Luckily, students came together to heal those wounds. Rather than accept the DTF Tour strategy, Haverford students realized that the best thing to do was to meet in person and be respectful with one another. Although Kennedy could not make it to the meeting and students cycled in and out as time permitted, the discussion consistently had more than half a dozen participants during the hour that I spent there. While we did not solve any of the world’s great problems in that time, I feel that the meeting worked wonderfully as an opportunity to exchange ideas in a respectful manner among people who have fundamental disagreements with each other about (primarily) the Israeli-Palestinian conflict. For me, it was an opportunity to get to know people whom I otherwise might not have met and to get to see a different side of some of my friends. Over the next few days, I had a number of informal conversations with students about the DTF Tour. While these students and I would often disagree about certain specifics, every student I spoke with wanted to engage in a respectful discussion. In this way, I suppose it can be said that the DTF Tour had a positive impact at Haverford. By its destructive force, the DTF Tour forced Haverford students to address some of the issues that the tour seemed to attempt at bringing up, but the students did so in a respectful manner. In fact, even though Kennedy was a classmate of mine last semester, it was not until this controversy that we ever had a conversation. Now, even though I disagree with him on some of the issues surrounding the DTF Tour and certainly on issues regarding Israel, I consider him a friend who I’ve never had anything but pleasant interactions with. Once I decided to write this series of posts, I spoke more formally with some Haverford students about their experiences at DTF Tour and had a chance to speak with Craig Dershowitz, the founder of Artists 4 Israel. What I learned will be addressed tomorrow in part-two of this series.